The top 7 needed EdTech tools that you will find in every Smart Classroom. The backbone of any Smart Classroom, interactive flat panels (IFPs) play an integral role in helping teachers and students engage in the classroom. IFPs have replaced traditional blackboards and interactive whiteboards to become the main focal point at the front of the class, instantly drawing attention and curiousity. Connectivity to a range of other classroom devices and solutions, as well as, to a teacher's laptop allow for a wide variety of flexible curriculums to be enabled in the classroom. Further, multi-point touchscreen features allow multiple users to interact with the IFP at the same time and built-in software allows IFPs to access and share resources with students' in-class learning or remote devices, making IFPs a powerful resource for instant communication and connectivity in smart classrooms. Flipped and remote classrooms have become very popular alternative classroom setups over the past decade. With the introduction of tablets, laptops, and other classroom learning devices, teachers have begun to rely more on these technologies to help students do everything from research, problem solving, question asking, and homework. Learning devices help students not only have more access to their teachers, but also provide them instant access to the largest library in the world: the internet. In order to successfully implement the aforementioned type of electronic learning, schools need to have access to the latest in charging solutions. The most common available solutions for classrooms are charging cabinets and carts. These charging solutions come in variety of sizes for all different sizes of classroom and are normally constructed from high quality materials to provide the maximum amount of security for the classrooms expensive learning devices. The most recent variations of these charging solutions are equipped with high-end charging technologies; like smart cycle or intelligent charging, that make sure all devices are optimally charged for use and protected from charging overloads to help increase the life of classroom devices. Apps have come a long way since they first began attacking pigs with birds. Classroom applications provide a way for teachers to utilize material from outside their school and integrate it into their planned curriculums. The newest generations of IFPs use easily accessible operating systems so teachers can download their favorite apps directly to the IFP, which makes them simple and easy to start quickly in class. Beyond just apps, other programs can be found inside modern IFPs like remote scheduling functions, linked event planners, and administrative access from a control point that allow for clear organization and effective classroom management. Presentations have always played a role in the education of young learners. In the smart classroom visualizers, also known as document cameras, have taken over the role of traditional back lit projectors. These easy-to-use presentation tools provide high quality visuals, zoom, and connectivity options that are necessary for the best flipped classroom experience. Teachers are able to showcase any type of learning material to students not only from the front of the classroom, but directly to student devices so that students can experience science or math class from a new and exciting perspective and with built-in recording, streaming, and annotation functionalities students never miss a single detail. Even in the most populace districts of the world there seems to be one thing every school has in common: a lack of teachers with expertise on every topic. 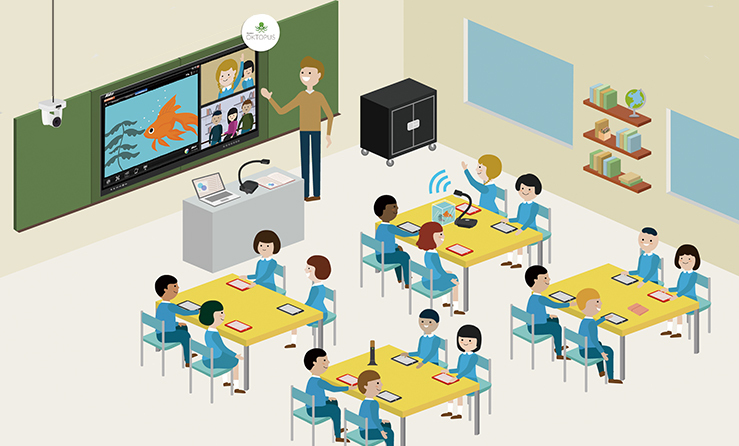 Classroom conferencing systems have become an extremely popular tool to help bring more expertise into the classroom by connecting students to anywhere around the world. Classroom conferencing systems don’t just connect students to expert teachers, but also allow students to experience an untold amount of exploration. Culture sharing initiatives, guest speakers, and access to interesting characters from all around the world, allow students to have a new experience every day without ever needing to leave the classroom. This helps schools save money on travel, while providing students with a unique learning opportunity. A commonly overlooked part of the smart classroom is the capability to record and stream class. “Why would you want to be able to record or stream a class,” I hear you ask. Well as I am sure you wanted to be a good student, like most, missing a single class can be the difference between getting an A+ or an A. Students are already stressed enough with growing up. The smart classroom provides an opportunity to alleviate some of that stress by allowing students to still engage by taking part directly or after the fact by streamed or recorded lessons. Sick? Watch the livestream and connect with a smart device. Away? Watch the recorded class when you get back. Students should enjoy learning, not be stressed by it. Classroom recording systems like lecture capture cameras or professional PTZ cameras allow this. Are you ready for the digital classroom revolution? See what the future classroom looks like in action!